Click here to obtain the full text. Below is a short summary of the main features of the above theory by Louis Nielsen, Senior Physics Master at Herlufsholm, Denmark. The theory is based on the assumption that everything is quantized, based on the quantization of space, time and mass. To find out which is the physical shortest length and the physical shortest time interval, let us consider Heisenberg's uncertainty relations. The greatest possible mass is the mass (may also appear as energy) of the Universe, M. The greatest possible velocity is the speed of light in vacuum, c0. Thus the highest possible momentum is the product of these two and we find equation (1) for the elementary length, r0. Similarly we find equation (2) for the elementary time, t.
Inserting known values of constants, we get equations (3) and (4). Every length and time in the Universe must be r and t, multiplied by an integer. If we call the present extension of the Universe R and the present age of the Universe T, we get equation (5) for the integer n, by which r and t must be multiplied to get R and T.
Interestingly this is the third power of N, which is given by equation (6). In this equation G is Newton's gravitation "constant" in our epoch, kc is Coulomb's constant, e is the elementary charge, me, and mp are the masses of an electron and a positron, respectively. N is the ratio between the electrostatic and the gravitostatic attraction between an electron and a positron. (Maybe this formula does not look familiar, but this may be because in the text books is normally used the mass of a proton, and not a positron. The full text will explain). Presuming n is exactly N to the third power, we get equations (7) and (8) for the connection between R and r0, and T and t0. At the birth of the Universe, there was only one unified force. As we see from (6) the gravitational force is in our epoch 10 to the power of 42 times weaker than at the beginning. If we call Newton's "constant" at the beginning G0, we get equation (9) from (6) and (8). This means that as time goes, the gravity varies with time as the third root of elementary time divided by elapsed time. If this curve is drawn you will find an extreme decrease at the first moments and then a flattening after some million years, meaning that in our time it is impossible to measure any decrease. In equations (10), (11) and (12) we have differentiated, and find that what is really necessary to measure is "Gdot over G". By analyses of data from double pulsars, a figure as in equation (13) has been found, fully in accordance with the present theory. Inserting the value from equation (13) in (11), we get the present age of the Universe. Inserting in other equations gives us the total mass of the Universe, in equation (14). The above is the fundamental basics of Louis Nielsen's theory. It further contains a comprehensive two-field gravitational theory, mathematically identical to the Maxwell equations in electrodynamics. The dynamical rotation field is in our epoch so weak that no direct measurements are possible. However, it causes the Coriolis force and is the reason why galaxies, stars and planets all rotate. Due to the extremely high gravity at the birth of the Universe, instead of production of hydrogen, helium and maybe lithium, as current theories predict, it is Louis Nielsen's opinion that elements with extremely high nucleonic numbers were created. The rapidly decreasing gravity spreads lumps out like fireworks, letting them decay as pressure fell. Galaxies and stars are born from rotating neutron balls, exploding in different stages, creating stars and planets. 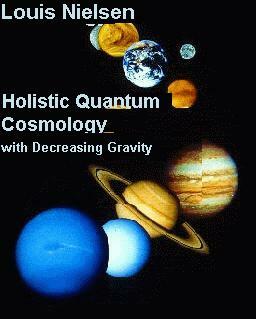 Louis Nielsen's theory: Quantum Cosmology with Decreasing Gravity.